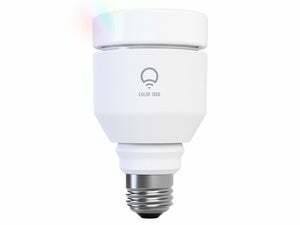 The Sengled Element Touch is a ZigBee-compatible bulb with a few modestly compelling bells and whistles. The big one has nothing to do with “smart” anything at all; in fact, it’s rather old-school-dumb, taking the form of a small button built in to the bulb itself. Press that button once and the bulb dims to 75-percent brightness. Press again and it dims to 50-, then 25 percent, then off. Press it again and you’re back to full strength. Yes, with the Element Touch there are never more than four button presses between you and turning out a light. 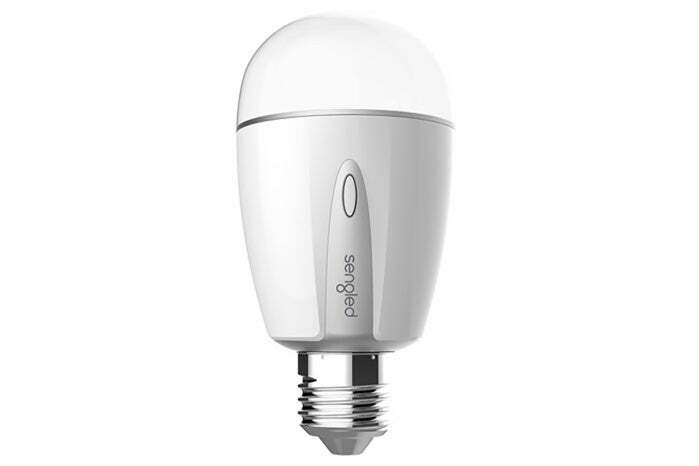 The bulb isn’t manually tunable, but it does change temperature based on that brightness. At 100-percent brightness, the bulb emits a cool-to-neutral 3500K. This steps down as the bulb is dimmed until you hit 25 percent, where temperature hits a warm 2700K. 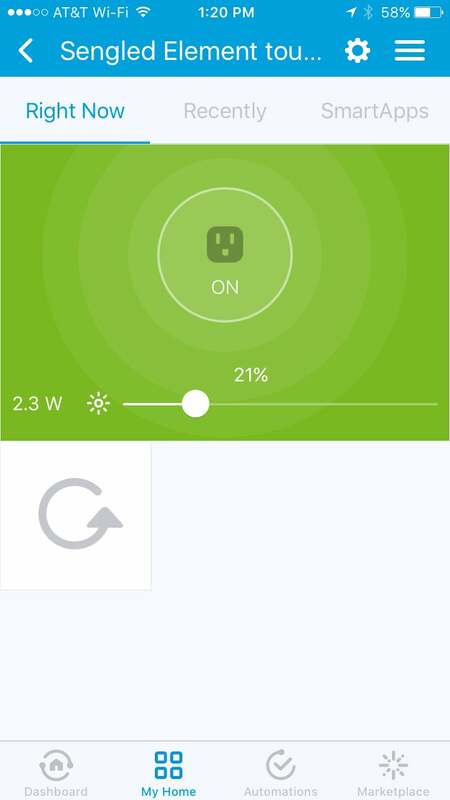 This effect is automatic and takes place whether you dim the bulb through the switch or through your ZigBee control app. Speaking of the control app: We had no real issues with setup or management, with the sole exception that SmartThings detected the Element Touch not as a light bulb but as a smart plug. This occurred even when we tried to set up the bulb specifically as a lighting product rather than letting the app auto-detect the unit. It’s not a huge deal, since all you can do through the app is turn the bulb on or off or dim it (here indicated as reducing its power consumption rather than dimming the light, but it’s essentially the same thing), but OCD types may object to the wrong icon showing up. The bulb also worked fine with SmartThings’ automation systems. The Sengled Element Touch automatically changes its color temperature when you adjust its brightness. The inverted-egg shape of the bulb looks a bit funky, but it does fit work well enough in fixtures. Light is fairly omnidirectional, with solid coverage for nearby reading (at least at full brightness). Conversely, the size and placement of the dimming/power switch is far from ideal. The button is extremely small and is nearly recessed into the base of the bulb. Depending on how your lamp and shade are set up, getting to the switch may not be easy, either. 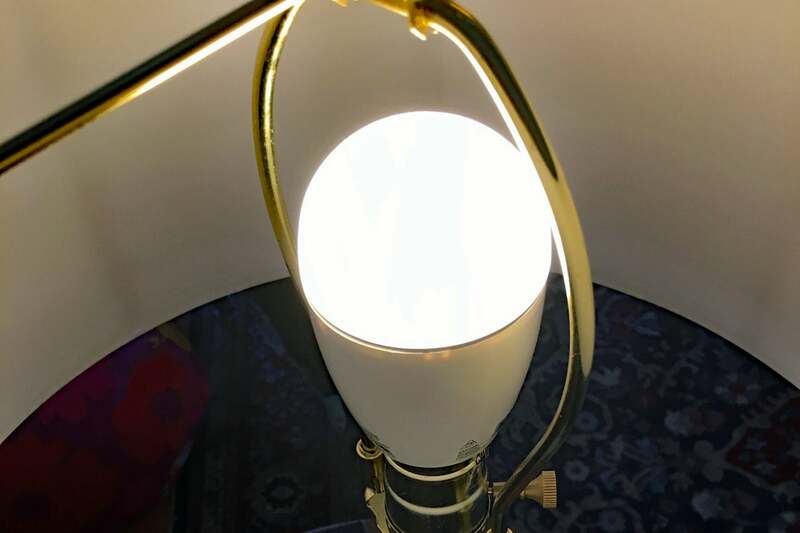 In my lamp, the prongs that attach the shade to the base of the lamp were almost exactly in the way of the button, requiring fiddling with the lamp hardware to make the button accessible. Even then, using it meant reaching precariously close to the bulb and trying to press a button embedded into its base (which functions as a very hot heat sink). Finding the tiny button is hard, but pressing it is even more difficult. The button is stiff to the point where I thought I would knock the lamp over trying to press it once, let alone four times. All told, this idea gets an A for originality but a D for execution. 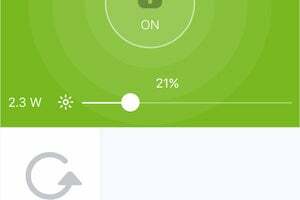 Sengled's app—and its bulb—have a curious limitation: You can't manually tune the bulb's color temperature. I have more appreciation for the automatic color-tuning system. It makes sense that when the bulb is dim, you would typically want a warmer hue. But at full brightness it isn’t necessarily the case that you would always want a colder temperature. If, say, you were reading a book in bed at night, you might need the full brightness of the lamp, but would want a quite warm shade in order to avoid keeping yourself awake. After dark, it’s simply a bit too cold for my tastes. 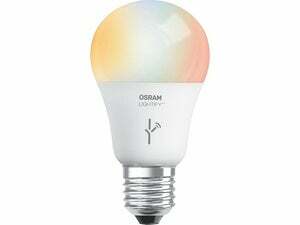 The good news is that the Element Touch is an affordable ZigBee bulb that produces plenty of light. 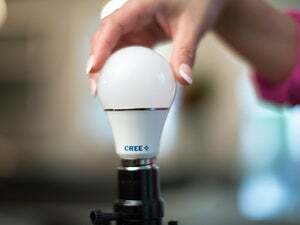 You may never use its physical switch, but it’s worth considering anyway, provided you can get onboard with the bulb deciding what color temperature it thinks you need.